Want to see some of the stuff I've made? Well, here you go. The good, the bad and the hairy. This page is still under serious construction. Watch for loose wires and stray straight pins. This was the mother to the 11 inch pad. You can't tell from this view, but the pad part is well over 1/2 inch thick. The day I made this I had just bleed though a ridiculously thick pile of terry cloth washcloths folded tri-fold, and was determined to make something that would soak up the flow. I've never tried it, but I am sure it would be a lumpy mother to sit on. I bet I could make it a twin, and wear them for shoes. It currently sits quietly in my experiments box. This nifty pattern was made by Jan_Andrea. The actual design is really worth making, and I plan to make more in the future. The pointy bits are the wings, and yes, there really is enough there for it to hold in place! However, I stuffed it with wool as an experiment. I choose too coarse a wool and it was just a mess. After one use and one wash the wool fibers worked their way though the flannel and it was like wearing a hairy dog between my legs. It's currently missing it's stuffing, and awaiting a new terry soaker core. 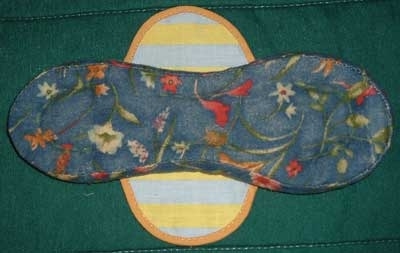 I hand sewed this pad around a year ago. At the time I only has a tiny photo to work from, and I had no idea how the luna really went together. 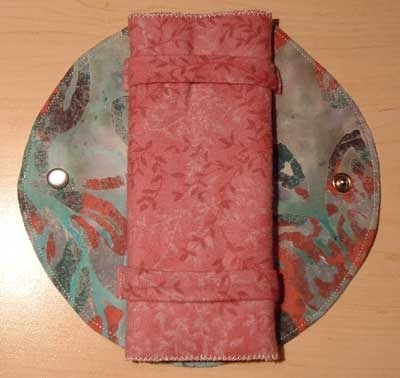 So in this one the ric-rack is attached to the center pad, and the center pad is sewed to the bottom. The raw edge is held in with blanket stitch, and it's held up really well after many washings. 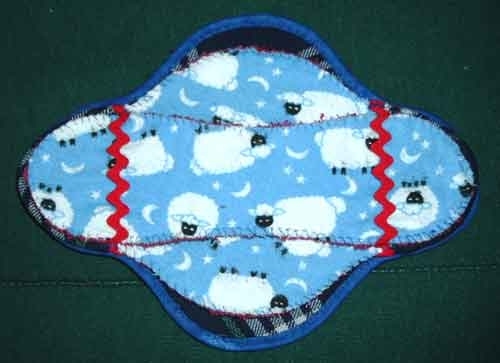 This was the first pad I've ever made. I still have it, and it still looks and works great. It's lined with PUL, which I found to be overkill for a paintyliner. 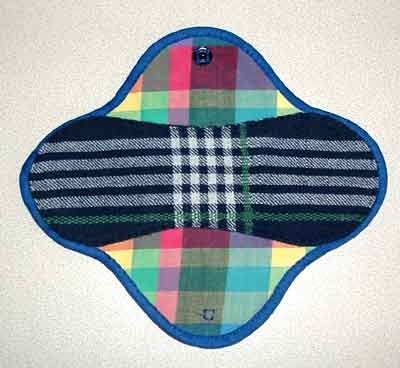 However, it makes a great end of the period type of pad. I'm not kidding. Call it a day, I am done looking at other patterns. I've used this pad completely though a period with no problems what-so-ever. The oversized circular wings are lined with PUL so worrying about leaks are a thing of the past. 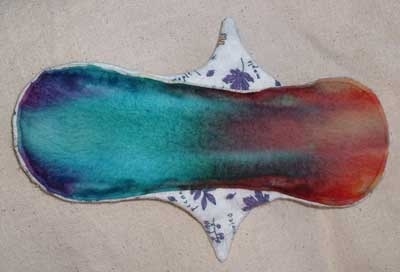 The center part can either be a terry/flannel combo, or just a long strip of flannel rolled flattened jelly roll style. 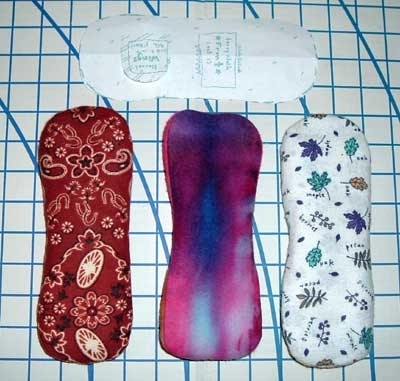 Just flannel dries really fast, so I am able to get though my whole period. 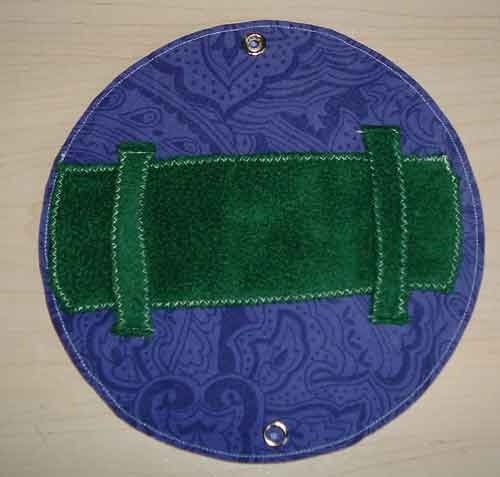 The green fabric is poly fleece. Yes, I know what I said about acrylic fabrics! In this case I made a exception. It provides a moisture barrier to prevent my flow from wicking down the wings and onto my clothing. Since I put the roll of flannel over the top, there is plenty of layers between me and the fleece. Also, I found fleece works great in the straps to prevent them from getting icky.